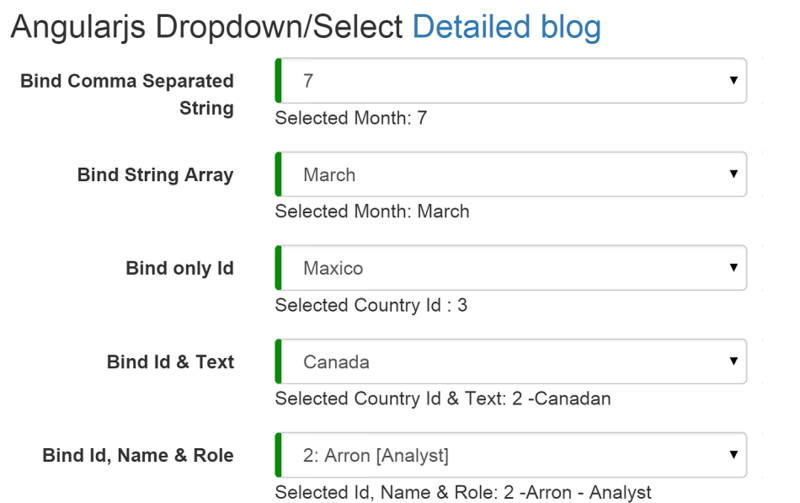 Angularjs dropdown/slect have more option than any other .net language dropdownlist, we can bind and get only Id or Text or both from dropdown, even we can bind and get more than two values like value, text and role from a dropdown and even more. We can try to see all the possible ways to bind the dropdown/select in this article, which is not possible to cover every thing but we will try our best to cover the topic. ng-options="x for x in csString.split(',') "
ng-options="x for x in months"
ng-options="x.id as x.name for x in countries"
ng-options="x.id as x.name for x in countries | orderBy:'name'"
ng-options="x as x.name for x in countries track by x.id"
ng-options="x as x.name for x in users track by x.id"
Some time we need to show the text in dropdown from different fields, the same we are going to see in this example. ng-options="x as (x.id + ': ' + x.name + ' [' + x.role + ']') for x in users track by x.id"